Offering you a complete choice of products which include hollow bearing chain and hollow bearing pin chain. We bring forth a precision engineered range of Hollow Bearing Chain to our clients. Offered pin Chains is suitable for usage in various industries and sectors. Fabricated as per market leading demands, these products are fabricated under the supervision of our team of dexterous professionals. Moreover, patrons can avail these in various sizes, grades and other detailed specifications as per their needs and requirements. With our expertise in this domain, we bring forth a superior quality range of Hollow Bearing Pin Chain. Offered Bearing Pin Chain is fabricated using quality raw material and cutting-edge technology. These products find extensive application in fixing attachments to outer links and are suitable for use in all conditions. This offered range is checked as per well-defined parameters to assure a defect free array. The unique "hollow" pin feature provides the user with unlimited conveyor versatility, allowing easy insertion of cross rods or attachments. Hollow pin chains are chains connected with hollow pins. Attachments can be easily mounted since the pins are hollow. 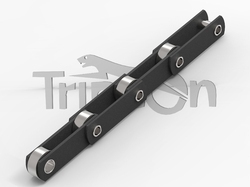 Hollow Pin Chains offer versatility in conveyor design, and allow for the insertion of through rods or other attachments Cross rods can be inserted into any link without disassembling the chain hollow rivets allow training by using rods that pass through the rivets in the chain. It has high strength, easy installation and fine finish. Looking for Hollow Bearing Chain ?